ANCIENT BRITAIN, Western Region, Inscribed issue, Dobunni, Boduoc (25-5 B.C. 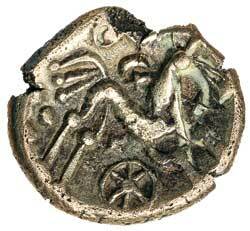 ), gold stater, of celtic style, (5.40 g), obv. 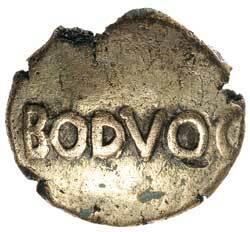 BODVOC across field, rev. celticized horse to right, six spoked wheel below, crosses and pellets in field, (S.388, ABC 2039, Van A. 1052, BMC 3135-42). Good very fine and extremely rare. Ex Matthew Rich Collection, previously Noble Numismatics Sale 51 (lot 1097). Also Baldwins, London, by private purchase. It is believed that less than 10 specimens of this type survive.